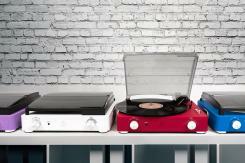 With the vinyl revival in full swing, GPO creates best turntables to fit with every music lovers taste. Just like music itself, your choice of turntable reflects what you're into and your own personal style. Here's a brief introduction to each of GPO's best turntables so you can choose the one that's right for you. View Details >> The GPO Ambassador is complete with Bluetooth and a rechargeable battery. That means it's fully portable and, with its tone tone suitcase style, you can bring your vinyl player whenever you want to go. The Ambassador also has a USB connection so vinyl can be converted to digital format. 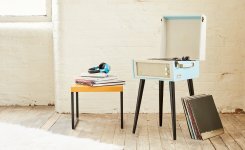 This record player comes in green and black, as well as cream and brown and is compatible with external speakers and can connect with speakers via Bluetooth. View Details >> Our first suitcase style record player, the Attache comes in a range of colours including blue, green, brown and red. 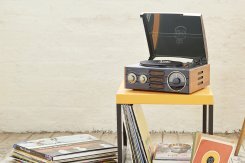 While very much focused at vinyl fans with its three speed turntable, the record player also has a USB connection enabling vinyl to be converted to digital format. The built in speakers can also be used to play tracks saved on the USB. View Details >> Another suitcase turntable in the collection is the GPO Flight, launched in 2017. With chrome finish on the buckles and edging of the turntable it's a sturdy kit. This is a portable turntable complete with rechargeable battery. It also features a cassette deck on the side, and a jewel stylus on the turntable itself. 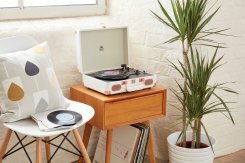 View Details >> Inspired by the classic sixties Dansette, the GPO Bermuda is a freestanding turntable. Its legs can be unscrewed and the record player rested on a flat surface. A full size three speed turntable, the Bermuda comes in red, blue or grey and a cloth finish. It enables both MP3 and USB playback meaning its the ideal music system for those who want to play both their analogue and digital tracks. 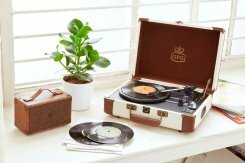 As the vinyl revival has encouraged more people to buy records and experiment with turntables, GPO's range offers choice for everyone to find the record player that suits them and their style. 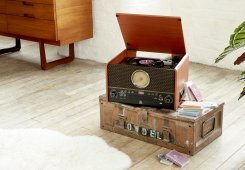 View Details >> With a rosewood finish, the Chesterton is a retro styled turntable with cloth speaker front, brass controls. It's also a music system that caters for almost every platform; it features a turntable, cassette deck, FM radio with analogue tuning. The Chesterton is also compatible with external speakers to boost its sound. View Details >> Similar in style is the GPO Empire, alo a wood finish and cloth woven speakers it also has a AM/FM radio and turntable. The brass dials design on the front of both the Chesterton and the Empire nod to a classic retro style. 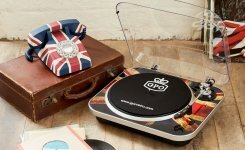 View Details >> The GPO Jam has a distinctive Union Flag motiff on its highly polished surface which makes it an eyecatching turntable in the collection. 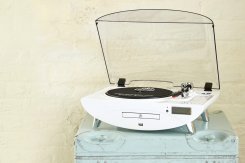 With a chrome finish and clear lid this is one of GPO's stylish record players, and one of its most popular. There's a USB connection on the Jam and it's compatible with all external speakers. View Details >> The crisp white finish of the GPO Jive makes it look quite futuristic, although it's a nod to the seventies curved interior and gadget design. With a weighted arm, with chrome detailing, the Jive allows for more precise playback. As well as a turntable, it features a CD player and USB connectivity. There's also a remote control making it the ideal addition to any living room. 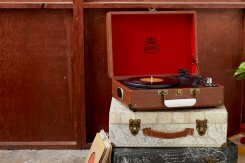 View Details >> One of GPO's first record players was the Memphis and it remains one of the our most popular. A 5 in 1 it combines style with practicality. 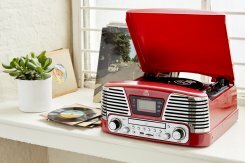 With a full size three speed record player, a CD player, FM radio with LCD digital display, a jack to connect MP3 and smartphones, as well as external speakers and a USB and SD card to convert music or play digital tracks. The Memphis comes in black, cream, red and silver. View Details >> Made exclusively for HMV, the GPO Soho comes in black and gold, or white and rose gold. 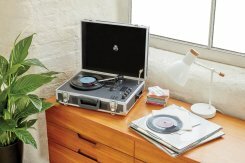 The suitcase style three speed turntable offers a stylish music solution. It features built in speakers, an auto stop function and allows external speakers to be connected. View Details >> For those who want to gently step back in to the vinyl market, the Stylo II is the ideal solution. Available in five distinctive shades, the Stylo II is an improved version of the classic Stylo. It has a rubberised finish with variable speeds and twin built in speakers. Stripped back, but still stylish.